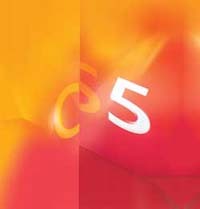 Adobe Creative Suite 5 Design Standard is tightly integrated professional software for delivering distinctive print design in marketing collateral, magazines, books, packaging, and more. Achieve exceptional quality even under the tightest deadlines with best-in-class drawing, image editing, page layout, and print production tools. New Adobe Creative Suite 5 Student and Teacher Editions give students--and now educators--access to low prices on full versions of the latest Adobe design software. The low prices enable educators and students in K-12 and higher education to acquire print, web, video, audio, and mobile design tools to more easily produce standout work. Using the software, students can develop the digital communication and creativity skills they need for academic and career success. Adobe Student and Teacher Editions include Adobe Creative Suite 5 Master Collection, Design Premium, Web Premium, Production Premium, and Design Standard software, as well as Adobe Photoshop CS5 Extended software and other individual CS5 products. Express your most innovative creative visions in print, using tightly integrated software for moving fluidly and confidently from inspiration to output. Accelerate creative reviews with new Adobe CS Live online services that integrate with your Creative Suite software. CS Live online services are complimentary for a limited time--visit www.adobe.com/go/cslive for details. Create compelling digital images with Adobe Photoshop CS5, the industry standard in digital imaging. Use versatile brush tools to paint with realistic strokes, precise selection tools to make exacting refinements, and a wide range of workflow and performance enhancements to accelerate everyday tasks. Craft compelling graphics with Adobe Illustrator CS5, the vector-drawing environment used by design professionals worldwide. Experiment freely and quickly to achieve the look you want for illustrations, creative effects, typography, and color. 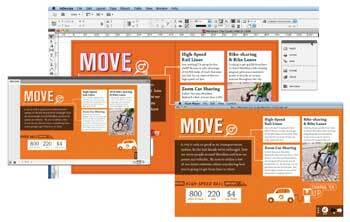 Lay out stunning pages faster and more efficiently in Adobe InDesign CS5 with an intuitive design environment, precise typographic controls, built-in creative tools and effects, robust preflight capabilities, and a host of productivity features. Prepare files for high-end print production with confidence using Adobe Acrobat 9 Pro. End-to-end PDF workflows share common technology to generate, preview, and print PDF files, enabling consistent high-quality output. Bring creative reviews directly into your design workflow using new CS Live online services that integrate with your Creative Suite software. Initiate a quick online review from within Photoshop, Illustrator, or InDesign. Reviewers comment in their browser using simple annotation tools, and you view comments in the context of your work--making it much easier to match each comment to the right design element. Use robust preflight features to check files for high-end print publishing. Catch production glitches as you lay out pages, avoid color output surprises in graphics, and apply output presets to reliably meet exacting production standards and minimize costly errors. Easily compose beautiful type for page layouts, images, and illustrations using robust styles in InDesign CS5 and Illustrator CS5, along with a host of advanced typographic controls for creativity and precision. Explore artistic possibilities with built-in Photoshop effects, nondestructive effects, and finer transparency controls in InDesign CS5. Create or modify images with brush tools and paint settings in Photoshop CS5. Sketch naturally and draw in accurate perspective in Illustrator CS5. 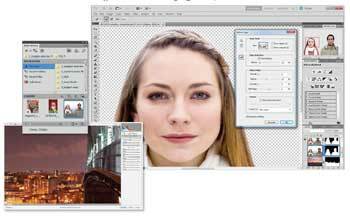 Photoshop CS5 provides unparalleled editing and enhancement control with powerful new selection-refinement tools that produce superior results with complex subjects and state-of-the-art noise removal, sharpening, and raw-image processing with Adobe Camera Raw 6. Click to enlarge. 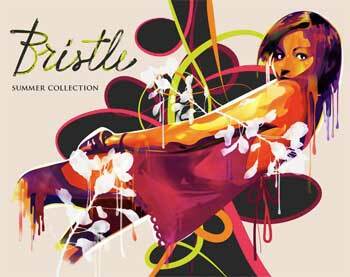 Paint freely in Illustrator CS5 with the vector-based Bristle Brush to produce lifelike brush strokes. Click to enlarge. Adobe InDesign CS5 software provides precise control over typography and built-in creative tools for designing, preflighting, and publishing documents for print, online, or to mobile devices. Click to enlarge. Adobe Photoshop CS5 delivers breakthrough capabilities to help you create images with impact. Refine your images with reengineered photography tools for removing noise, adding grain, and creating high dynamic range (HDR) images. Get precise results when making complex selections. Remove any image element and see the space fill in almost magically. Paint with naturally textured brushstrokes and realistic color blends. Also work fast with cross-platform 64-bit support and dozens of other time-savers. Create distinctive designs for any project. Used by creative professionals worldwide, Adobe Illustrator CS5 software provides precision and power. Paint expressively with vectors, draw in perspective, and explore designing for interactivity. Move easily between Illustrator, other Adobe products, and Adobe CS Live online services. Get the job done efficiently but beautifully, moving quickly from multiple ideas to multiple outputs with complete control and delivering exactly what you had in mind. Take advantage of exceptional precision and power to create distinctive vector artwork. Combine highly controllable drawing tools with expressive natural brushes and dramatic effects to make unique, striking designs. Speed up your workflow with innovations that encourage efficiency. Get the job done with purpose and agility using shortcuts and time-savers to take multiple ideas to multiple outputs. Incorporate vector artwork into essentially any project and deliver resolution-independent graphics across media. Enjoy tighter-than-ever integration with other Adobe products and go anywhere your creativity takes you. Adobe InDesign CS5 software provides precise control over typography and built-in creative tools for designing, preflighting, and publishing documents for print, online, or to mobile devices. Bring documents and presentations to life with interactivity, animation, sound, and video. Leading industry tools, and productivity enhancements make page layout simpler and faster. Access Adobe CS Live online services* from within InDesign to streamline critical review processes. Build powerful documents as a team. New integrated tools and the availability of efficient online services make review processes more efficient, whether your clients and colleagues are across the hall or around the world. Create, edit, and publish documents faster. A wealth of new productivity features help make page layout simpler, easier, and speedier. Engage, inform, and attract readers with documents that include interactivity, animation, video, and sound. Develop stronger, more compelling communications with rich interactive documents. Adobe Acrobat 9 Pro software builds on the foundational feature set of Acrobat 9 Standard to provide business and creative professionals with additional capabilities, including enhanced security features, high-end print production support, and easy-to-manage electronic document reviews. Use included Adobe LiveCycle Designer software--a professional form design tool--to create, customize, and automate dynamic forms. Gain the input you need--in real time--through interactive, shared document reviews that help participants see and build on each other's comments. With powerful new creative tools, enhanced performance and workflows, and the ability to integrate with timesaving new Adobe CS Live online services, Adobe Creative Suite 5 software provides the edge you need to create rich content for virtually any media--print, web, interactive, video, audio, and mobile. Whether you need to produce printed pages efficiently or design and distribute engaging content online, on film, on air, and on device, you'll find the right combination of Adobe tools to increase your productivity and keep pace with your creative vision. 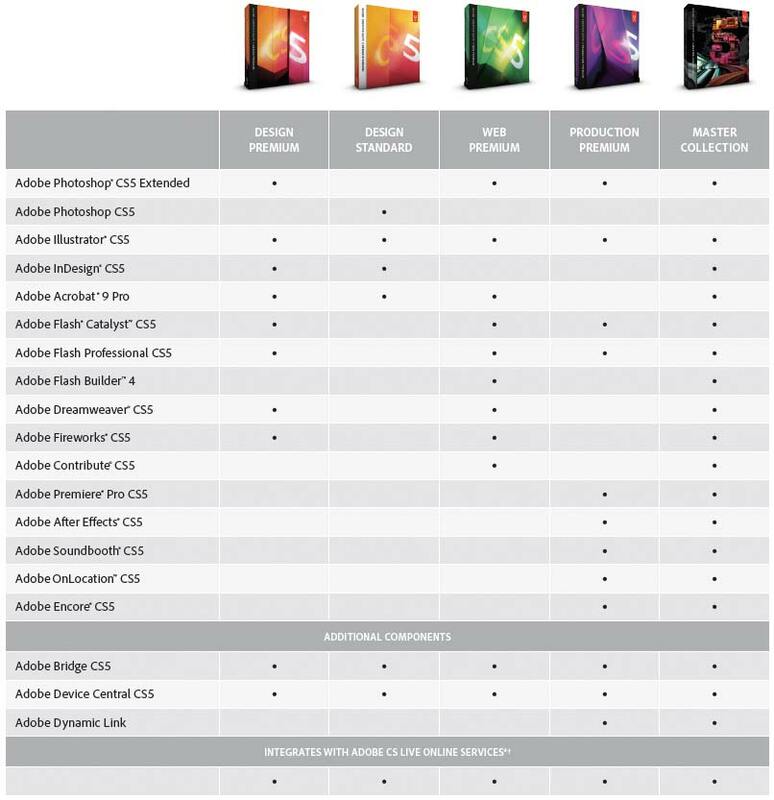 Express even your most innovative creative visions in print--Adobe Creative Suite 5 Design Standard combines Photoshop CS5 Extended, Illustrator CS5, InDesign CS5, and Acrobat 9 Pro. Meet stringent deadlines with enhanced object selection and editing in Adobe InDesign, more precise image selection in Adobe Photoshop, perspective drawing in Adobe Illustrator, and a host of other timesaving features. Add impact to print designs using new tools in Photoshop and Illustrator that let you create scalable vector artwork with the nuance and subtlety of fine art, enhance photographs with painterly effects, and more. Bring creative reviews directly into your design workflow thanks to CS Review, a new Adobe CS Live online service that integrates with your design software. Quickly initiate and share a review and receive comments.